The aim of this document is to offer guidance which would facilitate the knowledge and implementation of EU legislation underpinning Natura 2000 in relation to aquaculture activities. The guidance mainly focuses on the implementation of the provisions of Art. 6(3) and 6(4) of the Habitats Directive (Appropriate Assessment of plans and projects) and are designed to contribute to a better understanding of the conservation objectives of the sites, promoting best practices which illustrate how nature protection provisions can be compatible with sustainable aquaculture development. The development and application of spatial planning, including Maritime Spatial Planning (MSP) together with Integrated Coastal Zone Management (ICZM), can facilitate the proper allocation of sites for aquaculture activities. 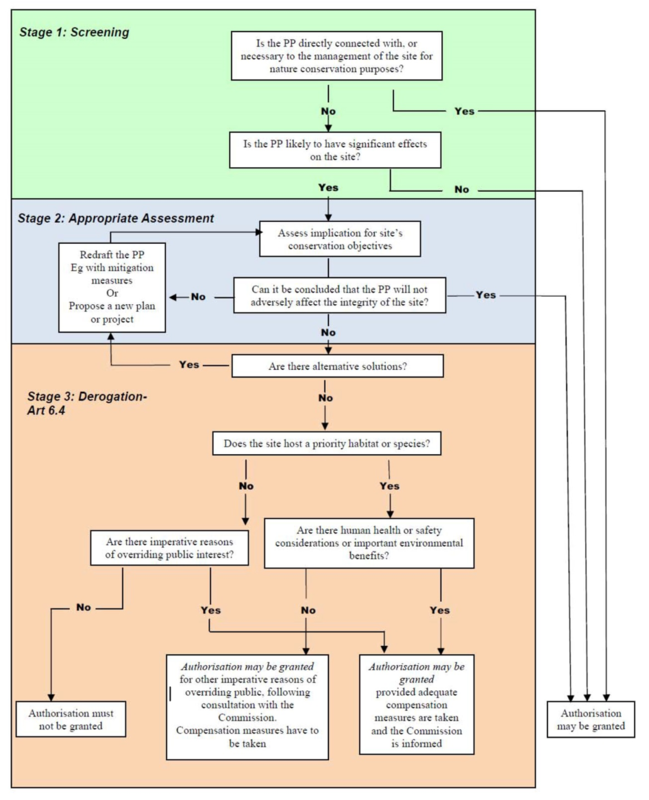 How can the need for an Appropriate Assessment procedure for aquaculture siting be evaluated? Which are the main factors to be considered when evaluating the potential impacts of aquaculture activities on Natura 2000 sites? Aquaculture represents a growing contributor to the production of aquatic food worldwide and aquaculture production in the EU is an important economic activity in many coastal and continental regions. The Common Fisheries Policy aims, inter alia, to develop the full potential of EU aquaculture in line with the Europe 2020 objectives: sustainability, food security, growth and employment. In exceptional circumstances, a plan or project may still be allowed to go ahead, in spite of a negative assessment, provided there are no alternative solutions and the plan or project is considered to be justified for imperative reasons of overriding public interest. In such cases the Member State must take appropriate compensatory measures to ensure that the overall coherence of the N2000 Network is protected. (Article 6.4). One of the guidance developed by the European Commission in this context focuses on aquaculture. The aim of this EC document is to offer guidance which would facilitate the knowledge and implementation of EU legislation underpinning Natura 2000 in relation to aquaculture activities. The guidance mainly focuses on the implementation of the provisions of Art. 6(3) and 6(4) of the Habitats Directive (Appropriate Assessment of plans and projects) and are designed to contribute to a better understanding of the conservation objectives of the sites, promoting best practices which illustrate how nature protection provisions can be compatible with sustainable aquaculture development. It is aimed at providing guidance mainly to aquaculture operators as well as public authorities and other stakeholders (e.g. NGOs) involved in the sector. Stage 1. Screening. The first stage aims to determine whether an Appropriate Assessment is needed or not. This stage requires the collection of data and information about the considered aquaculture plan or project as well as the Natura 2000 site. Subsequently, it requires determining if the aquaculture plan or project is likely to have a significant effect and assess the risk of potential cumulative effects with other plans and projects. Stage 2. Appropriate Assessment.This stage of the procedure focuses on the Appropriate Assessment, with the purpose of assessing the implications of the plan or project in relation to the site’s conservation objectives. This stage includes the analysis of cumulative effects and, if needed, the identification of suitable mitigation measures necessary for minimising or even cancelling them in case of impacts. Stage 3. Derogation procedure under Article 6.4. The requirements of Article 6(4) of the Habitats Directive establish a set of conditions according to which the competent authority can authorise, by way of derogation, a plan or project even in case the appropriate assessment cannot demonstrate that the integrity of the Natura 2000 site concerned will not be adversely affected by it. The fulfilment of these conditions is subject to strict evaluation and is only allowed in exceptional circumstances. These conditions relate to the absence of alternatives, the presence of imperative reasons of overriding public interest and the adoption of all necessary compensatory measures. The main output is represented by a step-by-step procedure for evaluating possible impacts of aquaculture plans and project’s on Natura2000 sites and identifying consequent mitigation actions. Chapter 4 of the guidance recognizes the importance of strategic planning through MSP and ICZM in order to prevent pressure originating from aquaculture activity on Natura 2000 sites and reduce related impact, as well as to improve the acceptability of aquaculture in sensitive areas. By its nature the guidance proposes a step-by-step methodology applicable by all Member States.